Here’s your chance to live out your fantasy of being in your favorite superhero’s shoes. 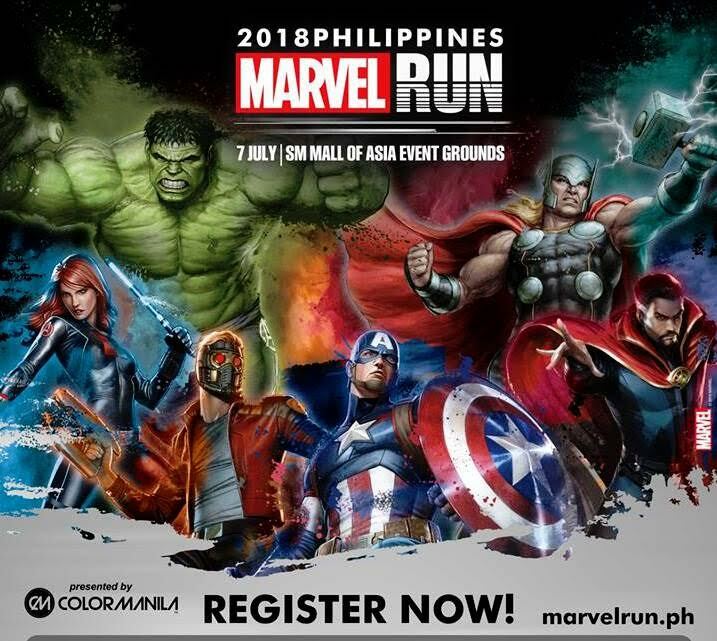 Organized by ColorManila, the country’s number one fun-run organizer, the first-ever Marvel-themed run in Southeast Asia – the MARVEL Run Philippines 2018, fires off this July 7 at the SM Mall of Asia Event Grounds. “We look forward to having the first Philippines MARVEL Run on July 7, and we would like to invite all MARVEL fans and ColorManila followers out there, to take part in this highly anticipated event. The runners will surely like the kits that we have designed and prepared for them, along with the other MARVEL items that come with the race packages,” ColorManila VP Justine Cordero said. There are four (4) race kit colors available, black, grey, green and blue. The black dri-fit shirt, which carries the logos of Thor, The Hulk, Captain America, and Spiderman, is part of the Deluxe Race Kit package. Priced at P1,500, the drifit shirt comes with a finisher’s medal, a race bib, and a color packet. While runners who sign up for the Premium Race Kit package and the VIP Race Kit package can choose between the grey, green and blue kits. Avenger fans would love to be seen in these kits with the green one carrying Hulk’s logo, the grey one with Thor’s logo, and the blue one with Captain America’s signature logo – his shield. The Premium Kit package, which is priced at P2,050, comes with a drifit shirt (with 3 colors to choose from), a race bib, sunglasses that match the shirt chosen, finisher’s medal, color packet, and a MARVEL drawstring bag. While those who join the VIP category, valued at P3,050, will get a drifit shirt (also with 3 colors to choose from), a race bib, sunglasses that match the shirt chosen, finisher’s medal, color packet, a MARVEL drawstring bag, towel, and lastly, access to the VIP Lounge. Runners also have the option of choosing between three race categories – 3K, 5K, and 10K. Registration is still ongoing. For more information, visit www.colormanila.com for more details. SnippetX is an exclusive content distribution platform for bloggers and independent content creators that makes SnippetMEdia more than just about news by empowering users to choose the blogs and websites they want to read and interact with.